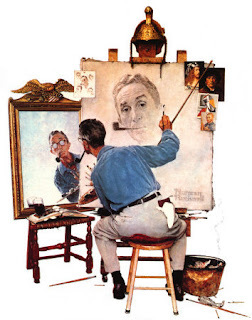 Norman Rockwell, who is often close to kitsch but undoubtedly skilled (and appraisal of whom yo-yos quite a bit) painted from photographs of posed models. PDN Photo of the Day has collected a few of these and some of the consequent illustrations. It's a pleasure to see what Rockwell did with them. Some commenters seem to think using photos is somehow cheating. Hrmph. Few would deny that Gerhard Richter makes high art, and many of his amazing paintings use photos as source material or even as substrate. I love much of his stuff and it can't even begin to be represented on the web. Get thee to a gallery!